The Weekend Gourmet: Red Gold's Summer Grillin' Party Sweepstakes...and a Red Gold Six Pack Giveaway! Red Gold's Summer Grillin' Party Sweepstakes...and a Red Gold Six Pack Giveaway! One of my favorite blogging partnerships is with my good friends at Red Gold Tomatoes. I first got to know the Reichart family, the owners of Red Gold, during the Taste of the NFL weekend in Indianapolis last year. They were such gracious hosts, and I learned first-hand about the quality and pride that goes into their tomato products. I’ve been fortunate to continue my relationship with the company since then, featuring their delicious tomato products and recipes several times a year. 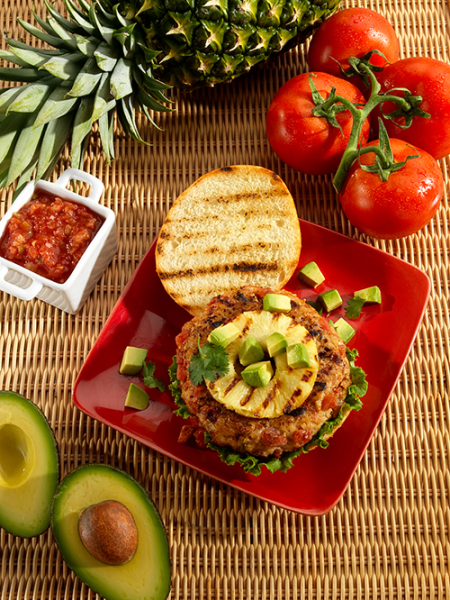 Today, I want to share a pair of healthy and unique Summer burger recipes that are perfect for the upcoming Labor Day weekend…and tell you about a cool sweepstakes that Red Gold is currently offering. 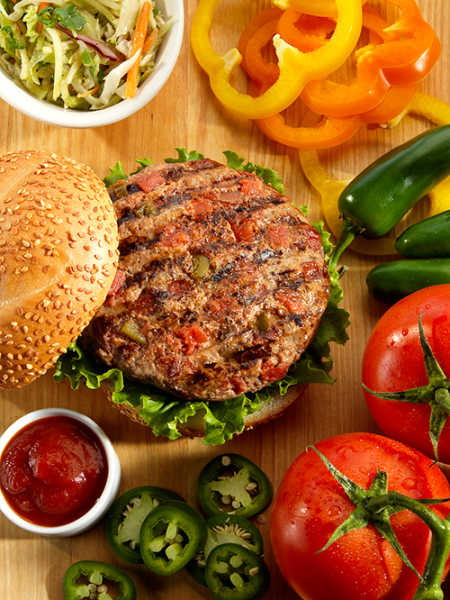 I’ve got a pair of burger recipes from Red Gold, both of which are flavored with their juicy diced tomatoes. Spicy Tomato Burger has all the spicy flavors that we love at Casa Garcia, and it’s so fast to whip up. Their tropical Caribbean Chicken Burger is made with healthy lean ground chicken and features festive island flavors. Both burgers are a snap to make and are perfect for a quick weeknight meal or your upcoming Labor Day cookout. Combine beef and tomatoes (well drained). Form the mixture into patties. Season, and add cheese to center of each patty for an added kick. Grill. As desired, serve on toasted bun with Jalapeño Ketchup or Chipotle Mayo. Combine ground chicken and Red Gold tomatoes (well drained). Form into patties. Season and grill. As desired, serve on a toasted bun. You can also layer guacamole, avocado, or roasted pineapple slice. Top with mango chutney or fruit salsa. Both of these flavorful burgers look amazing, and I plan to grill them up very soon! As I mentioned earlier, Red Gold is hosting a Summer Grillin' Party sweepstakes to celebrate the last part of Summer and grilling. They're giving away a popular Green Egg Ceramic Grill & Smoker. They're also giving away 1,000 aprons each week leading up to the grand-prize drawing. The promotion ends August 30th, so be sure to click the link above to enter. To celebrate this fun Summer grilling giveaway, Red Gold recently sent me a six pack containing some of their most popular canned tomato products. Even better? One lucky reader is going to receive the exact same prize pack that includes the limited-edition Mama Selita’s Jalapeno Ketchup. If you like spicy, you’ll love adding this ketchup to your favorite burger. It's the perfect spicy touch to burgers and hot dogs! To enter the giveaway, simply leave me a comment below telling me how you like to used canned tomato products. For example, I use them all the time to create quick pasta dishes for a busy weeknight dinner. Make sure to leave your e-mail with your comment so I can find you if you're the winner. I will accept entries until 1159 pm CST this Thursday 8/15. Good luck! Disclosure: Red Gold sent me a six pack of their tomato products to use in my kitchen and to promote their sweepstakes. As always, the opinions expressed are solely mine.